Soooo good! 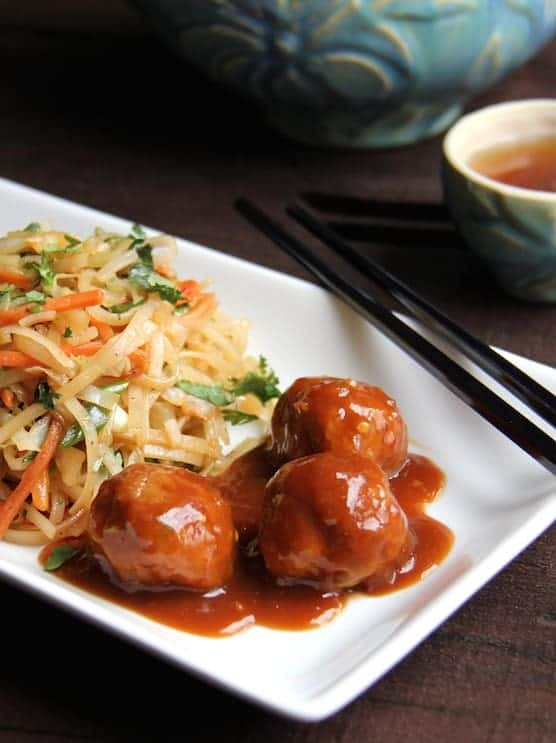 Put these Hoisin Glazed Pork Meatballs and Rice Noodles with Cabbage and Carrots in your life now! If any one food can put a smile on someone’s face, it has to be the meatball. These little one or two-bite morsels of meaty goodness have their place in cuisines around the world. Ground pork is often used in combination with other meats to add flavor and juiciness in things like meatballs and meat loaf. 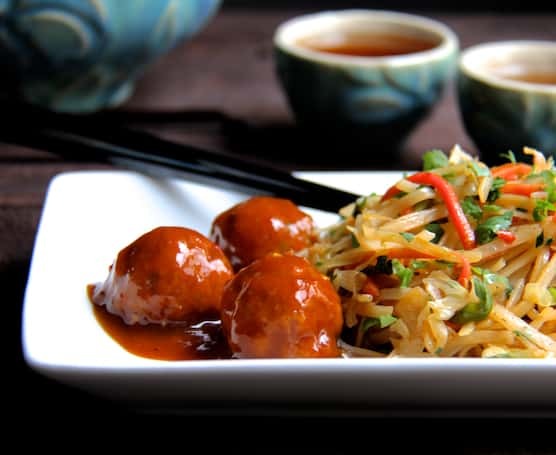 In my Asian-inspired hoisin glazed pork meatballs, ground pork takes center stage. When making meatballs, get all the ingredients except the ground meat mixed together before adding the ground meat. 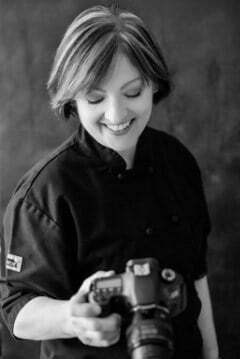 This ensures all the ingredients–especially the seasonings–are evenly distributed. When I mix up any ground meat dish, I wear disposable gloves and mix with my hands to get the job done faster and more thoroughly. The best way I have found to portion and form meatballs is with a 1-inch cookie dough scoop. Grab a handful of the meat mixture in one hand and the cookie dough scoop in the other. Use the heel of the hand holding the meat mixture to level off the scoop. Empty the scoop on a baking sheet. After portioning the meat mixture, roll into neat balls. Frying meatballs is messy and requires more active time and attention. Instead, I place on a foil-lined baking sheet and simply bake them. While the meatballs bake, mix up the hoisin-based glaze. Hoisin sauce, sometimes referred to as Chinese barbecue sauce, can be rather robust on its own. Combined with the other sauce ingredients, the hoisin is mellowed but still has great depth of flavor. Rice noodles tossed with sauteed shredded cabbage and carrots kicked up with black pepper make the perfect side dish. Rice noodles are a great alternative to regular pasta because they cook in only a few minutes. To save time, buy bags of shredded angel hair slaw and shredded carrots. Preheat oven to 375 degrees. Line a baking sheet with aluminum foil and spray with cooking spray. Combine scallions, half the garlic, 2 teaspoons ginger, 2 tablespoons soy sauce, 1/2 teaspoon chili garlic sauce, panko and egg in a bowl and mix well. Add the pork and mix until well combined. Form into 16 1-inch meatballs and place on prepared baking sheet. Bake for 12 to 15 minutes or until a meat thermometer inserted registers 165 degrees. Meanwhile, make the glaze. Combine remaining garlic, ginger, 1/4 cup soy sauce, chili sauce, broth, hoisin sauce, sherry, rice vinegar and corn starch in a small saucepan. Bring to a boil, reduce heat and simmer until thickened. 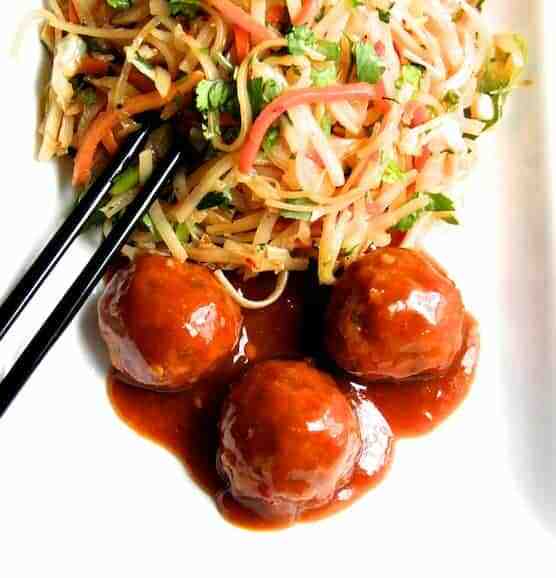 When meatballs are cooked through, transfer them to saucepan and keep warm while preparing the rice noodles. Cook rice noodles in boiling water with salt per package directions; drain well and toss with 1 tablespoon canola oil. Heat remaining oil in a saute pan over medium-high heat. Add the cabbage and carrot and cook 5 to 6 minutes, stirring often or until vegetables are crisp-tender. Stir in remaining ingredients, add the rice noodles and heat through. This dish looks so incredibly delicious.. and all that sticky glaze over the meatballs is making me drool. Just divine!